Nanowires are the future of electronics. But they usually require nasty chemicals and difficult processes the create them. 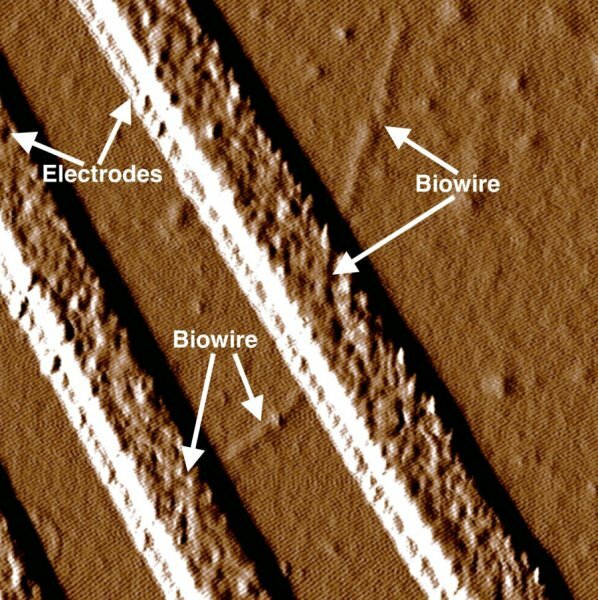 Scientists in Virginia have found a way to make bacteria form nanowires. Nanowires are becoming more and more important parts in modern electronics. They can be found in transistors, which are important components of all devices that have chips in them; your computer, your phone, your television and even in your calculator. Nanowires also play an important role in some new innovations in solar panels. MIT scientists have designed solar panels that are both cheap and flexible, and they also use nanowires. These flexible solar panels could, for example, be used to cover the whole surface of electric cars so they could power themselves. However, the problem with nanowires is that they’re pretty hard to make. There are basically two methods to make the small wires. The first one consists of obtaining large block of the material from which you want to make the wire (usually a metal such as copper), and cutting away all the excess. This technique can be likened a sculptor making a sculpture. The downside of this procedure is that nanowires are one billionth of a meter wide and mistakes are easily made. The other method is done by building up the wire from scratch.This is basically the complete opposite of the first one. This is similar to building with Lego. But when building a nanowire, the Lego bricks are fifty thousand times smaller than a human hair. So again, mistakes are easily made and this makes the creation of nanowires really difficult and expensive. But now, Yang Tan and his team have modified bacteria to make nanowires for them. 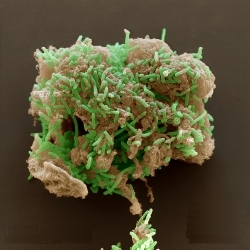 They took some very common soil bacteria called Geobacter sulfurreducens. This bacteria can already make thin wires that are somewhat conductive. But with some advanced DNA modification, Yang Tan and his team implanted DNA from another bacteria into the geobacter. This new combination of DNA makes the bacteria form thinner and more conductive nanowires. This method is much easier than the older methods, since the only thing you need to do is keep the bacteria alive and wait. Another advantage of the nanowires made by bacteria is that they are really eco-friendly. Nanowires made with the older method usually have all kinds of toxic substances which can be very harmful for the environment. The bacteria-made nanowires don’t have these toxic substances in them, so it’s no problem if they end up in the environment. It might even be possible to just put your broken computer in the organic waste bin in the future.